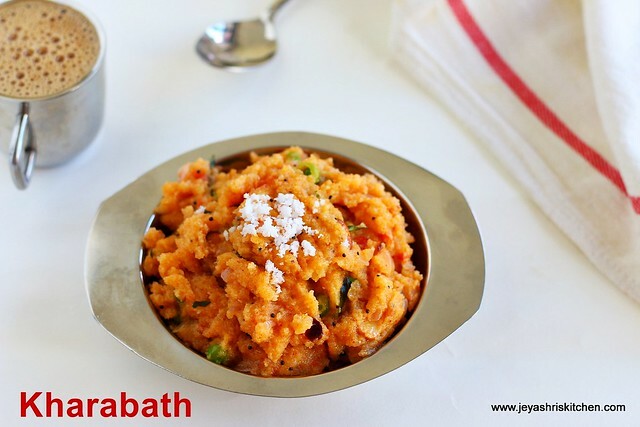 Kharabath is a popular breakfast of Karnataka. I have heard about this through my friends many times, but never tasted the authentic Kharabath which is served in MTR restaurant. Few weeks back a reader asked me for this recipe and it so happened for me to visit the MTR restaurant here the next week. I ordered for the kharabath and it tasted very nice. It is similar to the rava kichidi but red chili powder was added instead of green chilies. Also it was loaded with ghee. The next day i called up my friend who is a native of bengaluru and living in Australia now. 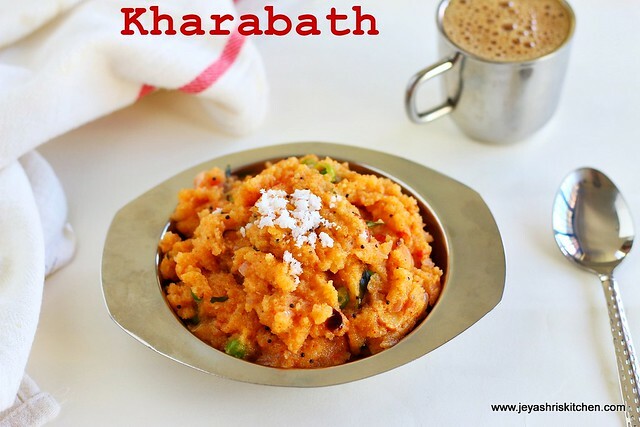 She told me few tips on this Kharabath recipe. Do try this recipe at home and let me know the feedback. Check out my other South Indian breakfast recipes. Dry roast the rava|sooji, in a pan for 5 minutes, without changing its colour. Keep it aside. In the same pan add oil and throw in the mustard seeds, urad dal, cashew nuts and curry leaves. Add the onions to the pan and saute it for few minutes, till they become translucent. Add the tomatoes, red chili powder, MTR vaangi bath masala, salt and green peas(if adding). Let this cook for 2 minutes till the tomatoes become mushy. Add 1 and 1/4 cup of water to this and allow this to boil. When the water starts boiling add the roasted sooji |rava to this and keep the flame to low. Stir it well to avoid forming lumps. Cook this in a low flame for 5-7 minutes, till all the water gets absorbed. Add the ghee now and mix well. Switch off the flame. Khara bath is ready to serve. Serve it hot with coconut chutney. My personal favorite is to sip a filter coffee and have a spoon of upma. MTR Vaangi bath masala enhances the flavour of the khara bath. I have tried with vaangi bath masala and without that too. I felt the addition of Vaangi bath masala brings the close taste of the MTR style khara bath. You can add finely chopped carrots too, while adding the green peas. Very nice Kharabath. Love that coffee mug!!! Where to get MTR vangi bath masala in Singapore ?